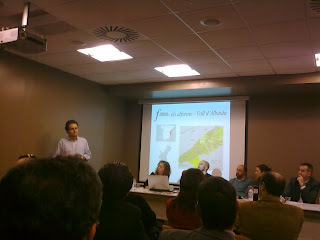 On Friday I was lucky to come within the TCV event at Feria Valencia, a Wine Tourism Forum in Valencia. 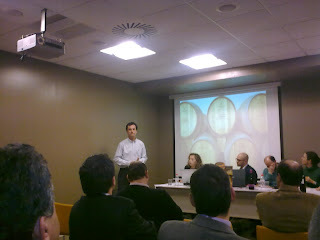 Lucky because I had the opportunity, in the tasting that followed the talk, to exchange views with people I admire the wine world, there was Pablo Calatayud, Miguel Velazquez, Joan Cascant, Felix Martinez and others, representatives of the most important wineries in the Community (Celler del Roure, Bodega Los Frailes, the Muntanya Celler, Vera Estenas, Aranleón, Torroja and Gandia Pla), all involved in projects of Wine Tourism. The word Enoturismo not quite like me too, so I would call Wine Tourism. 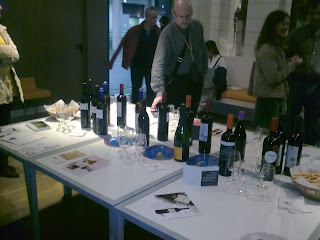 Each of these pioneering wineries and Gandia Pla with a fantastic program on his farm Hoya de Cadenas (see my post of May 2009), Los Frailes and Roure with a visit which may begin around the Iberian village of La Bastida (in Moixent), or site visits centenarian House Don Angel de Vera Estenas, or the old cellar Aranleón, and even a culinary tourism Bodegas Torroja, to a real tourism landscape of the Celler de la Muntanya . This mark, which could be Nostre Vi I saw (our wine) or Vitis Vinum et Mare Nostrum (VVetMN), with references to our Mediterranean climate, would bring together the entire supply, and could be structured by designations of origin, areas, regions, terroirs or state so that aggregate the supply today is individualized in each hold. With this brand and its content is an easy to offer to tourism in general and tour operators in particular. In my humble opinion I think they should build on this image and put aside any disagreement business to get to work on this aspect and particularly involving the local, regional, national and European level to make this wine region where it should be and not where they are getting. Ah! and tell them that the paper ended with a great tasting, where winemakers arranged their finest wine-making for the enjoyment of all who were there. Prior de Castilla 2006. Visiting Altaman Cellar. From land Castilla-La Mancha, in the so-called Manchuela Conquense, land of great appellations of origin and the Ribera del Jucar, the Manchuela or own La Mancha, we have to spend a day at the area around Motilla del Palancar (Cuenca). In particular the beginning of our trip focused on the Graja de Iniesta, a small town about halfway between Madrid and Valencia, near of the A-3 road. The reason for this visit was to discover the hidden wine cellar Prior de Castilla, a wine we've tasted in a restaurant whose owner has called the winery and special relationship with its partners, the cooperative is called Altaman, and is about 800 meters . to the center of Graja de Iniesta. The winery is a facility of less than 5 years, fully mechanized, with a nave with a capacity of about 2 million liters, with stainless steel tanks enclosed within a well insulated warehouse, his laboratory, his barrel room, its bottling ... all with excellent levels of quality and meeting strict health regulations that make only 2 people to manage the facility. The winery produces red and rosé wines from native varieties such as the Bobal and Cencibel and foreign, but well adapted, like Cabernet Sauvignon, Merlot, Monastrell, Syrah and others. His great commitment to making wines from grapes of organic origin and excellent facilities have made one of their organic wines, Prior de Castilla 2006 Ecologico, has achieved a silver medal at the Mundus Vini BioFach in Germany. Our visit began with a visit to the grape grape reception, the stemmer, the press and fermentation tanks, all on a new and very spacious area, then spend the barrel room, where the Prior de Castilla aging, a small room with about 25 barrels of French and American brothels type, room that can be stored perfectly hundreds of boots and I hope they leave some excellent wines in a future. We visited other facilities, but what I liked most was to conduct a live tasting straight from the tanks that store the wines ready for bottling. The first one I tried, is a rosé in preparation, which was still in pre-bottling process and which had a striking strawberry flavor in the mouth, to be 3 º C did not show any characteristic feature. The good were the organic Cabernet Sauvignon 2008 and 2009, different, the first with a tremendous density in the mouth with sweet tannins, fruit mother's own upbringing and that 3 to 6 months should be delicious in one years , the second in 2009 more fruity, a little vegetable, but different aromas and flavors. I tried also a very fruity Tempranillo but less aromatic and especially less dense. For dense, glyceric and greedy, an organic Syrah, a wine bottle that tastes good to wake up with game and lamb meal, a mixture of ripe red fruits and roasted roasted mouth was that long drink. One day in very cold and warm visit with Pepe gave us a wonderful person and a partner, we left a good taste in your mouth. This week I had the opportunity to taste 3 wines from different appellations from Spain. Such is the case that the first thing I took was of the DO Somontano, specifically Laguarres (Huesca), which for quite some time (since the boom of the Enate, Viñas del Vero, Montesierra ... that did not prove any of the area). This wine is marketed as a distributor, "la.marca.wines" based in Zaragoza and his name, certainly peculiar, is "Cojón de Gato", a name that comes from a popular type of grape upper Aragon, fat grain , long black that resembles its name, this grape is a very small proportion in the 'blend' (though the label says others). A varietal Syrah and Merlot, mainly, with little wood (6 months), cherry color with maroon piping live, high layer. The nose, very expressive, leaving berries, cherries, some cocoa, black pepper, very clear, and balmy, of course, in the background. The attack in mouth contradicts the visual phase and is light and warm. It goes to step muscular, and appear liquor and smoked. Is the end a youthful astringency and acidity, domable, swig. Next on the list was a wine of the DO Utiel-Requena, Bodegas de Utiel, preparer of Nodus, a young red wine with low parenting called Actum Varietal, a "blend" of Cabernet Sauvignon Merloy, brightly colored purple pillory very bright, has an intense nose, which presents some highlights minerals, fresh with notes of sweet fruit on the bottom. In mouth has good attack, the pace is slightly drying, with little tannin and a sweet tooth in the path of long drink. And the mountain of Alicante, Cocentaina specifically, we came the third wine, a Penya Cadiella 2005, a varietal Cabernet Sauvignon, Merlot, Monastrell, Tempranillo and Giró (Red Grenache) from Vins del Comtat celler, with a 6-month aging in French oak and American a rest period of 6 months in bottle. A wine with an intense ruby color, with oranged touches. On the nose reminiscent of vanilla, cinnamon and other spices like. Good attack on the palate, with sweet tannins and brisk, slightly sweet and with a background in herbs such as thyme and lavender, very soothing. As expressed in these notes, three different zones and three different wines that have made us the shorter week and prepares the weekend in search of new wines that will surprise us on the palate and other senses. This is a low-priced red wine (less than 2 euros) made with Tempranillo, Valencian Wines Cooperative Sinarcas La Protectora. Sinarcas is a municipality located approximately 100 km from the city of Valencia (Spain), belonging to the county Requena-Utiel and about 900 meters high. on sea level. This town is accessed via the N-330 road, from Madrid or Valencia from A-3 road and from the same N-330 road from Teruel, Alicante, Albacete and Cuenca. Her extension is largely made up of vineyards and cereal crops, the first being that more hectares occupied and have realized that wines like this comment. About 10 years ago I had the opportunity to taste a wine, Cerro Carpio, bought from the same winery and it was just bottled, it was a 6-month aging in oak, Tempranillo and still oozing think the purple, tannic and some vegetal character on the palate, after 2 years in my house (not for wine storage in summer) changed the tone to a more orange color, velvety in the mouth and is delicious for the occasion. Last week we bought a selection of reds, Arcaz reserve aged and Terra Ibera young wine, which the latter have opened a bottle and I enjoyed a young wine with a moderate degree alcohol, 12.5 º, a bright ruby color and very clean. On the nose full of red fruit, floral and fresh. Already in the mouth has good acidity, a balance between acid and sweet aftertaste with a wine that evokes its roots. A Tempranillo 100% wine from the D.O. Utiel-Requena to take every day and accompany this cold winter, ideal to take along a good cheese and accompanied by some dry rice and pork sausage or a good stew with beans or chikpeas . Are yet to try the red Arcaz aged with Tempranillo and Bobal, the jewel of the land in the region Utiel-Requena and I think we can surprise addition to the prices of these two do not reach the 4 euros per bottle.